This is an exciting time of the year. After thinking back on the highlights and low lights of last year, I can now turn my attention to the new planting season! We’ve definitely turned the corner with our weather here in Wisconsin, and I see gardening opportunities everywhere I look! Here are some of my ideas and goals for 2010. I thought it would be fun to share. Dwarf Pear Trees grown in espalier form behind my garage or along my dream fence. Hardscape fence with arch entrance for the “magical kingdom”. (magical kingdom is the nickname my daughter gave the space behind our garage; it is full sun.) We grow most of our edibles so a fence would be nice to keep the dog out, and maybe the bunnies, too. On this fence or arch entrance, I would like to try growing Birdhouse Gourds up and around, possibly in conjunction with another climber, like Clematis Paniculata. As I edit this blog, I have already changed this idea. I will keep it for you to see, but what has changed is that buying a new arch for the magical kingdom is definitely not in the garden budget this year. So I created a very large, very dramatic entrance with my tallest gardening stakes and then put my largest bamboo pole above. I plan to grow Scarlet Runner Bean up and around this from seed. I chose this because it produces both an edible flower and a bean we can eat, and it is a very fast grower. I am excited about this garden entrance and will try to remember to share pictures throughout the growing season. Artichokes. I have started these indoors since I learned about them last June and started them too late. I am most excited about these! I am growing these both for the visual interest and because we like to eat them, too. They are beautiful and kind of remind me of the Allium Globemaster look. So I will have the Allium Globemasters blooming in May and June and, I hope, the Artichokes for July, August and September. Brussel sprouts. Again, I’m growing these because they look very sharp; the bonus is we love to eat them and they are full of vitamins. My kids will eat anything they grow. Sweet corn. Another ornamental edible I am excited to try this year is a sweet corn that is really good-looking. The past few summers, I have successfully grown a nice trio of “plain old” sweet corn with green beans growing up it and little pumpkins below. The new varieties I want to try are Zea Mays, Japonica and Tiger Club. Other Ornamental Edibles I am planning to grow for both looks and nutritional value are Bright Lights Swiss Chard, Rhubarb, Broccoli, Ornamental Peppers, Kale, Cardones, Basil, Brassica Olemcea Kale, Parsley, Rosemary, Purple Hyacinth Bean, Pumpkin on a Stick, Edible Flowers, Pot Marigold, Nasturtium, Calendula Officinallis, Marigolds, Ornamental Millet, Sunflowers, and Beets. I love the color black, and I am drawn to black flowers and foliage in the garden. It adds nice contrast and a neutral dramatic color. I am excited to try Ornamental Millet Purple Majesty in my 2010 Garden; the birds are going to love my backyard once again! There are a lot of dark Ornamental Edibles. 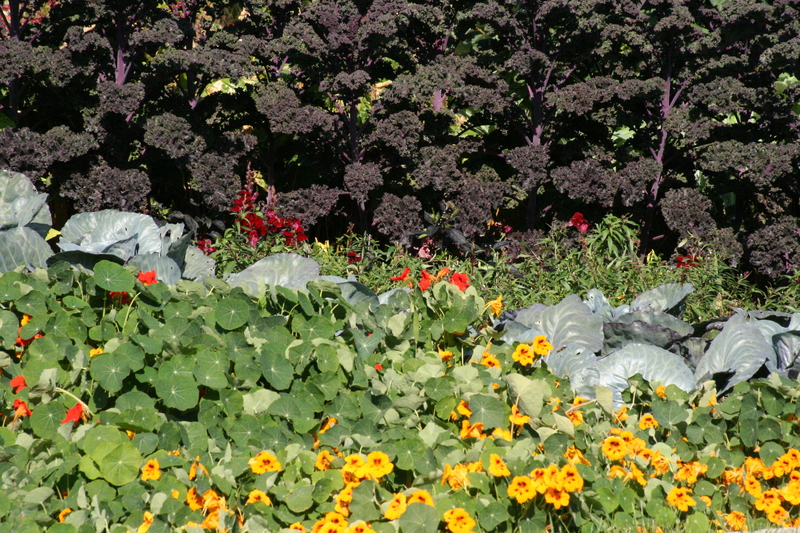 I am going to try Nero di Toscano and stunning, dark-leafed Kale. I am also going to try Early Purple Sprouting Broccoli. Dark purple petunias. I love petunias because the smell of them takes me back to Palm Desert, California, heaven on earth for me. I loved how Allen Centennial Gardens in Madison had these planted in masses; they smell amazing in the evening. I plan to plant these underneath my 4 family-room windows in hopes of having the wonderful Palm Desert, California, smell enter my house. Again, I am going to buy early because I tried to do this last summer after visiting Allen Centennial Gardens, and all the stores were sold out of the dark purple. On a side note, it seems to me that the purple flowers are more fragrant than the white flowers. I planted loads of White Petunias because I love how they look at night, but it seemed that the purple flowers had a stronger scent. I just had the same thing happen in my house last week with Hyacinths. I bought both white and purple from Whole Foods, and I noticed the purple ones were way more fragrant than the white ones. I’m just sayin’ . . .
Black elephant ears. Another idea from the amazing Allen Centennial Gardens that I plan to copy is to plant large Black Elephant Ears in between my existing White Hydrangea Limelights. More fragrant Lilies under key windows. I love the smell of Casa Blanca Lilies and Stargazer Lilies and have many of them in my yard. This summer I want to plant them in key spots to get the smell where I can appreciate it without having to cut them and bring them inside. I have a nice base of Hostas, Liguria, Ferns and Hydrangeas in the shadiest corner of my garden. I am hoping to pull this area all together by weaving Hakonechloa Grass throughout this shade garden. It is also known as Japenese Forest Grass, and its lime-green color should be a great accent in this shade garden. Liriope or lily turf. My mother-in-law told me about this plant, and I am very excited to try it. It likes shade so I am going to put it in my shade spot that could use a makeover. In the fall, I love decorating with Bittersweet. One measly little bunch can be $15-$20, so I am growing my own. I have heard Bittersweet can be thuggish, so I am going to plant carefully, but I do want it in my garden. I also love to decorate with Red Dogwood Branches and Winterberry in the winter. Every winter I think Why am I buying this? I should have these to cut from in my yard. But then in the spring I forget about it. This spring I am not going to forget. It will be much cheaper to buy the shrubs than to purchase those individual twigs. I also have a nice assortment of Evergreens to cut from to fill my window boxes: Pine, Boxwood, and Cedar. Both for fragrance as well as vantage point, I am going to plant Lilies and Petunias underneath key windows and by doors. The window I look out most is my – you guessed it – kitchen window. I am going to focus on having 4-season interest. This has been a work in progress, and I have finally made some strides here. But it still needs work. So for 2010 I hope to achieve this goal. So far I have beautiful Alliums to look at in the early spring. I am going to add a New Dawn White Climbing Rose that I see again and again in P. Allen Smith’s garden photos. I am also going to make sure one of the Dogwoods with the red winter twigs will be in a spot that I can see out my kitchen window. Of course it doesn’t get any better than a hot-pink Zinnia or sunny bright yellow Sunflower. Annuals are great to plant in a key vantage point as they keep their color all summer long. you could also try Double Red sweet corn.